I was asked for the 1,000th time today whether telomerase causes cancer since it is present in 85% of cancers. I found this interesting article supporting my focus on a cancer stem cell model- that is to say not all cancer cells are immortal either and there are special ones that retain their super-powers, like flying. Front Med China. 2007 Jul;1(3):294-8. doi: 10.1007/s11684-007-0056-9. Determination of telomerase activity in stem cells and non-stem cells of breast cancer. Li Z1, He Y, Zhang J, Zhang J, Huang T.
Although all normal tissue cells, including stem cells, are genetically homologous, variation in gene expression patterns has already determined the distinct roles for individual cells in the physiological process due to the occurrence of epigenetic modification. This is of special importance for the existence of tissue stem cells because they are exclusively immortal within the body, capable of self-replicating and differentiating by which tissues renew and repair itself and the total tissue cell population maintains a steady-state. Impairment of tissue stem cells is usually accompanied by a reduction in cell number, slows down the repair process and causes hypofunction. For instance, chemotherapy usually leads to depression of bone marrow and hair loss. Cellular aging is closely associated with the continuous erosion of the telomere while activation of telomerase repairs and maintains telomeres, thus slowing the aging process and prolonging cell life. In normal adults, telomerase activation mainly presents in tissue stem cells and progenitor cells giving them unlimited growth potential. Despite the extensive demonstration of telomerase activation in malignancy (> 80%), scientists found that heterogeneity also exists among the tumor cells and only minorities of cells, designated as cancer stem cells, undergo processes analogous to the self-renewal and differentiation of normal stem cells while the rest have limited lifespans. In this study, telomerase activity was measured and compared in breast cancer stem cells and non-stem cells that were phenotypically sorted by examining surface marker expression. The results indicated that cancer stem cells show a higher level of enzyme activity than non-stem cells. 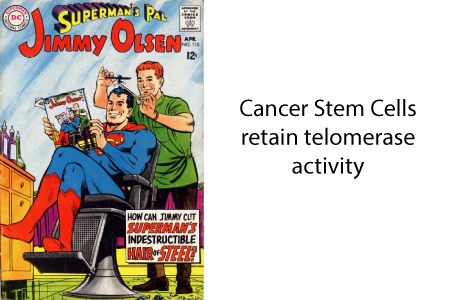 In addition, associated with the repair of cancer tissue (or relapse) after chemotherapy, telomerase activity in stem cells was markedly increased. To understand further, check out this page from my website about cancer stem cells.